Warwickshire wrapped up an eight-wicket victory over Durham despite a battling century from opener Mark Stoneman. Stoneman, who resumed on 83, reached 111 before he was run out to leave the visitors 252-7, still 13 runs behind. Paul Coughlin (49) and John Hastings took them ahead, but both fell to Rikki Clarke after lunch and Keith Barker finished the innings with his fifth wicket as Durham were all out for 327. Warwickshire lost two quick wickets but Ian Westwood (32no) saw them to 63-2. The win, which earned the home side a maximum 24 points, saw them maintain their unbeaten start to the season in Division One, while Durham have now lost two games, but remain second. 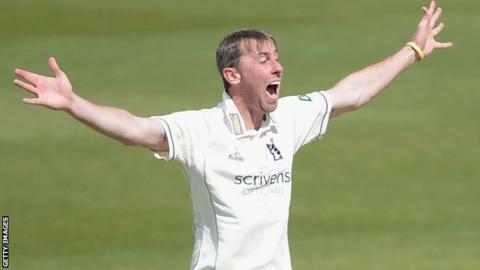 However, the match will be remembered primarily for Barker's efforts with both bat and ball as he narrowly missed out on becoming the first Warwickshire player since 1911 to score a century and take 10 wickets in a first-class game - as his 5-103 gave him match figures of 9-157. Resuming on 189-4, still needing 76 runs to make the hosts bat again, Clarke removed skipper Paul Collingwood lbw early on although the former England batsman looked from from impressed with the decision. Stoneman soon brought up his first century of the season from 179 balls, but Durham were further in trouble when the out-of-form Phil Mustard edged Barker to William Porterfield at third slip. Then, just as it looked he would take Durham into the lead, Stoneman was farcically run out from the non-striker's end as he went for a single, but was sent back by Coughlin and 17-year-old substitute fielder Aaron Thomason swooped to send the ball back to Jeetan Patel who whipped off the bails. Coughlin and Hastings upped the scoring rate before lunch with a fifty stand, but any hopes of saving the game were extinguished shortly after the interval when both were out to Clarke (3-61) in the same over. Barker ended the innings when he had Chris Rushworth caught by Clarke to finish with his 10th five-wicket haul in first-class cricket. Requiring just 63 for victory, but without captain Varun Chopra who was hit on the leg while fielding, the hosts soon found themselves 12-2 after Porterfield fell third ball and Jonathan Trott was run out. Westwood and Laurie Evans steadied any nerves to see their side home in 17.4 overs. "In these last two games we have been more 'Warwickshire' than we had before and hopefully we can carry that on. "I think we will always be up there or thereabouts in Championship cricket especially. "It is just a question of getting on a roll and making sure we are in contention towards the end of the season." "We were pretty positive this morning. We felt that with six wickets left we were in with a chance of making something of the day. "Mark played really well but the run-out wasn't a great piece of communication, and unfortunately Mark was the victim. "It's a busy time coming up but we've shown resilience before. I'd like to not have to show resilience after defeat but that's something we're going to have to do."